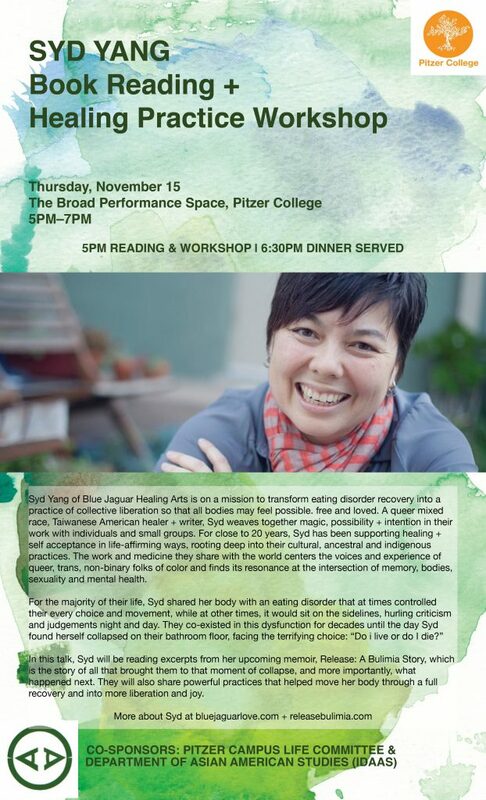 Syd Yang of Blue Jaguar Healing Arts is on a mission to transform eating disorder recovery into a practice of collective liberation so that all bodies may feel possible. free and loved. A queer mixed race, Taiwanese American healer + writer, Syd weaves together magic, possibility + intention in their work with individuals and small groups. For close to 20 years, Syd has been supporting healing + self acceptance in life-affirming ways, rooting deep into their cultural, ancestral and indigenous practices. The work and medicine they share with the world centers the voices and experience of queer, trans, non-binary folks of color and finds its resonance at the intersection of memory, bodies, sexuality and mental health. In this talk, Syd will be reading excerpts from her upcoming memoir, Release: A Bulimia Story, which is the story of all that brought them to that moment of collapse, and more importantly, what happened next. They will also share powerful practices that helped move her body through a full recovery and into more liberation and joy.